Your common driveway gates are strong, but they also require some form of maintenance and repairs to keep them functioning optimally. Read on and learn more about some of the problems you might run into with your gate, and how our experts can be of service. 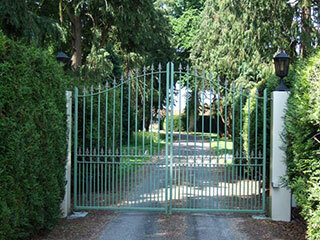 A gate can be very convenient if it is remote controlled but it is its most convenient when they are fully automatic. To have a fully automatic gate, you should have sensors installed. These function to 'sense' a car entering or leaving the premises. These sensors then prompt the opener motor to swing or slide the doors open, depending on the type that you have. If your sensors are no longer working, then our gate repair is the one for you. If you don't have sensors put in yet, we can also install them for you too. A gate door is commonly very heavy. The two most popular materials that are used for its construction are wood and iron -- both of which are heavy unto themselves. To carry the weight of the doors, hinges and wheels are employed. When wheels have been around for a long time, things may start to fall off and they may completely break down. If this happens, all of the weight will be transferred to the hinges and perhaps even to the mechanical arm attached to the opener motor, causing damage to them. So, if your wheels stop turning or completely break down, call our team for gate repair to get it fixed. The function of your gate literally hinges on your hinges. When the gate doors swing to open and close, they rely heavily on the hinges for support and mobility. When the hinges are not properly mounted with the right welding technique, they may easily come off due to the heaviness of the doors they support. Another problem that may cause deterioration of hinges is weld joint corrosion. Rust has always been the bane of metals. When you see that your hinges are starting to fail, then call us at Garage Door Repair Stamford and we'll take care of everything. We'll make sure to repair hinge weld joints or replace the hinges altogether to strengthen the gate.